New to Nagios XI 2014, is the ability to generate reports based on service level agreement (SLA) statistics. In addition to the already included Availability Report, the SLA Report gives you the ability to prove, via already monitored hosts and services within your Nagios system, that you are meeting or exceeding those pesky up-time agreements. 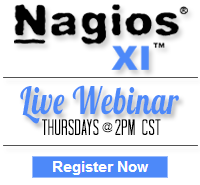 As per traditional Nagios XI reporting capabilities, there are a wide variety of included time periods that will fit most use cases, as well as the ability to generate reports based on custom time periods. Reports can also be filtered by Host, Hostgroup, and Servicegroup for maximum flexibility when only specific hosts and services need to have reports generated. The final important aspect when generating a report is the modifiable SLA Target value. This allows you up to 5 points of precision when generating reports and can fully calculate the five 9s(99.999%) used in so many cases. Category: Business Monitoring, Cool Stuff, Nagios XI, Reports, Tech Tips, UI and Updates. Closed Tags: availability, monitoring, nagios, Nagios XI 2014, reports, Service Level Agreements, SLA, SLA report, SLA Target, up-time agreements. Category: Awesome, Configuration, Databases, Nagios XI and Wizards. 2 Comments Tags: database, mongodb, mongodb server, monitoring, nagios, nagios xi, nosql, wizards.